I’ve been using Windows Vista on occasion recently. When I used it for the first time, I was expecting to see the now infamous ‘Cancel or allow?’ dialog boxes popping up left and right. To my surprise there was nothing of the sort. 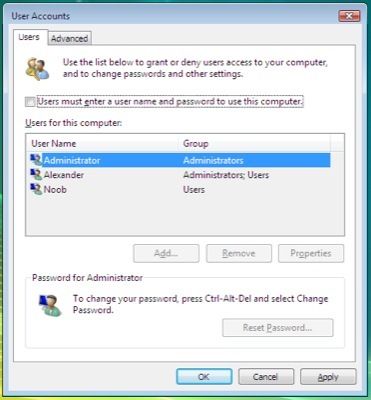 It took me a moment and to realize that the default account that had been created for me in Vista was an ‘administrator’ account, which allows you to do anything. I’m not really sure why this is the default account. It’s like your Linux box would log you in as root by default. But fair enough, if that’s the Vista way, that’s the Vista way. I went ahead and created a normal account for myself and logged into that account instead. Everything was well until I restarted my Vista machine the next time. I found myself right back in the administrator account. Apparently Vista insists that Administrator is the right account to be in. To make a long story short, it took me just about forever to figure out how to make Vista not log me in automatically this way. I’m going to post it here to help other people with the same problem. 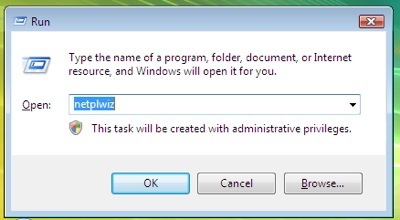 Enter “netplwiz” and click “Ok”. Check the “Users must enter a user name and password to use this computer” checkbox. Hope that helps someone. It’s hard to find for sure. You can also check the box, and then click on another account name in the list, thus selecting it. Then uncheck the box again and you’ll be asked for the password for that account – now the selected account is your new default account. If you make this a non administrator account you should have increased your security a little bit during day to day computer use.